If your staff is going to assist with cycle counts, you may need to update their User permissions (temporarily or indefinitely). The permissions they'll need depend on what part of the cycle count they're helping with. A User needs to have the User permission Import/Export Data checked to export the file from Ascend to the scanner. It also lets them import the file back into Ascend after they're done scanning. 1. Select the Database Explorer icon > Users or select the View dropdown > Users. 2. Double-click the User name to edit their profile. 3. Select the Permissions Tab in the Edit User window. 4. Scroll to find the box for Import/Export Data and check the box. 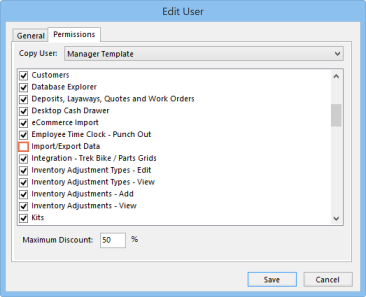 The Administrator and Manager user permission templates automatically check off the Import/Export Data box. The Cashier template does not. After the product file is imported into Ascend, the User needs to investigate product quantities that are "off," and then reconcile the numbers once everything has been tracked down. You can find these permissions by using steps 1-3 above.